There is no question that sons look most like their fathers. They don't resemble their neighbors, friends or even their pastors. Unless plastic surgery is involved, they don't resemble pop icons or movie stars. They simply look like their parents. This is the natural order of things that God put into motion way back in the garden. Everything reproduces after its own kind (Genesis 1:24-25). Like begets like. Apple trees bear apples and pear trees produce pears. It would be the most unnatural thing imaginable if this wasn't the case. Yet in our Christian worldview, we sometimes aren't able to see this as clearly as we ought to. Since we have been born anew into the Kingdom (John 3:3) and carry our Father's seed (the Greek word for seed is 'sperma' - 1 John 3:9), the most super-natural thing in the world should be that we would look like our Father who happens to be Almighty God! Of course we know that all mankind was created in the image of God (Genesis 1:27) but our reflection of His image goes much farther than that now because of our new spiritual birth. Because of our union with Jesus, we are now a new kind of species altogether (2 Corinthians 5:17) and are partakers of God's very own divine nature (2 Peter 1:4). It seems easy for us as believers to acknowledge the fact that since God is our real Father, then we must be His children. But do we really grasp the ramifications of what that statement means? We carry the same DNA as the One who created the universe! Keeping in mind the principle that 'like begets like', what are the implications of us truly being born of God? If God is our real Father, then who are we from heaven's perspective? I think one of the reasons that believers shy away from talking about our divine origins (in Christ) is the fear that we might be aligned with New-Agers who declare that everybody is a god unto themselves. We are not God and we will never be God, but because of the cross, we now have been joined with the Godhead by virtue of us being in Christ (John 17:23). Here's an example from our own family. Our little 6 month old granddaughter is almost the duplicate image of her mom. Sometimes when little Riley is playing with us, I get flashbacks of our own daughter (Kristin) when she was a baby. There is nothing that Riley has to do to make this happen because her similarities to her mom are woven into her DNA. And just as little Riley did not have to try and look like her mom, neither do we have to 'try' and look like God. It is the mysterious and glorious free gift of God's DNA (His grace) that has been given to every believer who has been born into the family of God. We could never earn it or deserve it (Ephesians 2:8-9) so we might as well just receive it for what it is... We are the most precious gift that the Son gave to His Father when He brought many children to glory (Hebrews 2:9-11) through His sacrifice on the cross. While our broken soul and our carnal nature can still wreak havoc on us and others this side of heaven, from God's vantage point, our old nature is dead (Romans 6:6). We can try to prop it up like a lifeless corpse all we want, but our true nature is the one that is seated in heavenly places in Christ (Ephesians 2:4-6). In Ephesians 5:1, the Apostle Paul writes... Therefore be imitators of God, as beloved children. (ESV) The NIV version says it this way... Follow God’s example, therefore, as dearly loved children. The Amplified Bibles translates it... THEREFORE BE imitators of God [copy Him and follow His example], as well-beloved children [imitate their father]. Whatever version you prefer, the point is that we were all created to reflect the glorious image of our Heavenly Dad. And the more that we realize that each one of us has been designed to uniquely reflect God's image in a way that no other person every could, the freer we will become to simply relax, and sink into the beautiful reflection that we were created to be. While I am sure the 'WWJD' (What Would Jesus Do) movement of trying to replicate the works of Jesus had the best intentions, I don't think that is what Paul was trying to say in Ephesians 5:1 when he wrote that we should 'imitate God as His dearly loved children'. I am convinced that if we simply believe the truth that we are loved and valued by God, and that He really is our true Father, we will be able to step into our one-of-a-kind identity as His beloved kids and just be ourselves. The more that we can rest in the Holy Spirit's work of conforming us into the image of the Son, the more that the Spirit of Sonship (Galatians 4:6-7) will find its true expression in our every day lives. Our friend Jack Winter used to say, "If you want to look like the Father, focus on being a son to Him." 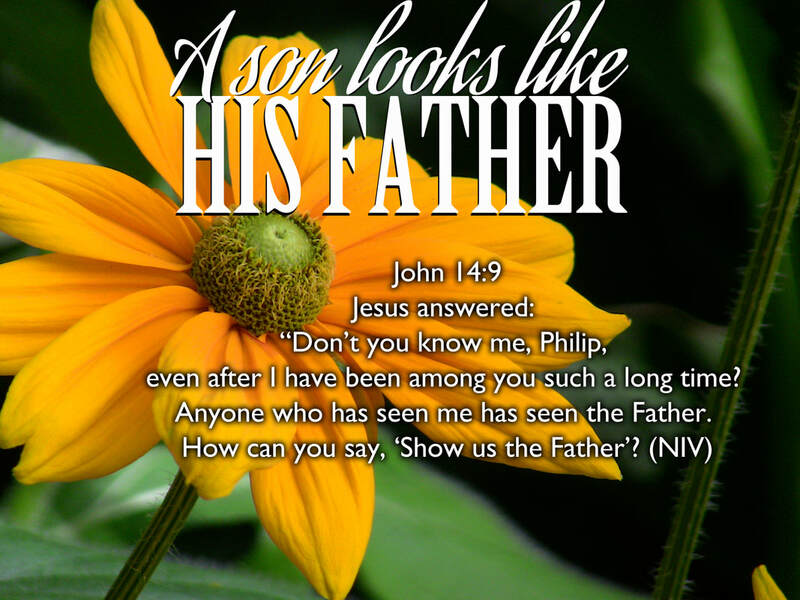 Of course, the greatest example of sonship that the world has ever seen was Jesus Himself who looked just like His Dad! I believe the key to us living out the greater works of our Elder Brother (John 14:12) and fulfilling the good works that our Father prepared for us to do (Ephesians 2:10), is found when we simply believe that we are enough. No more, no less. We don't have to try and be something or someone else because God's true reflection can only displayed through the real, authentic us. The truth is that because we are His beloved sons and daughters, we cannot help but reflect His image in our inner being. My prayer today is that we would all have the courage to stop comparing ourselves with others, and learn to live our lives being completely and wonderfully loved as God's beloved kids. I truly believe that all creation is waiting for the glorious reflection of Papa's image that only you can reveal to the world. After all, it is children that most look like their parents!